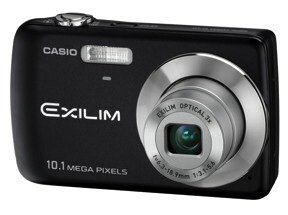 It’s the season for new digital cameras, with Casio today announcing its new range of EXILIM compacts. 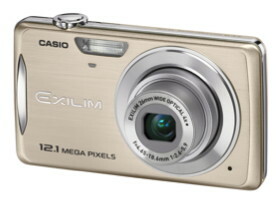 First up is the EXILIM EX-Z280 featuring a 12.1-megapixel, 4x optical zoom zoom 26mm wide angle lens, Casio’s EXILIM Engine 4.0, image stabilisation, HD video recording at 720p, and a 2.7-inch widescreen TFT color display. There’s also a dynamic photo function that lets you take the subject out of one photo and then use another photo as a background. You can even cut out several subjects from a serial picture recording and use these to create an image sequence in which only the subject moves and the background remains static. Saves trying to mess about in Photoshop anyway. There’s also a Make-up mode which smoothens and softens facial skin (on the photo, not in real life sadly) and has 12 levels of sensitivity. The EX-450 and Zoom EX-Z90 come with intelligent autofocus that identifies non-human photo subjects and determines focus and exposure area. Both offer a 12.1-megapixel lens, up to 4x optical zoom, landscape mode that can enhance vivid colors or remove mist, and a number of the features previously described. Finally, the EX-Z33 has a best shot function that will automatically adjust settings depending on what’s being shot, and includes 23 scenarios including portrait, scenery, flower, sundown, candlelight portrait and sports. It has a 10.1-megapixel, 3x optical zoom lens, and comes with a mode that only takes the photo when the camera is still or the subject smiles. There’s also a YouTube capture mode (if you must). Plenty of choice from Casio there. Exact pricing and availability depending on your region. See recent compact cameras from Canon (new PowerShots), Samsung, Pentax, Sony and Nikon.